In Jerusalem and in areas of the West Bank today, five Palestinian terrorists carried out brazen shooting and knife attacks with the intent of murdering Israeli security forces and presumably, the civilian population at large. Averting a potential massacre and acting in self defense, Israeli forces shot dead the five Palestinian assailants. In some cases, returning fire after being shot at by Palestinian gunmen. How did Canada’s media cover these attacks? This headline was marred by the fact that it failed to mention that these 5 Palestinians initiated several shooting and stabbing terror attacks on Israeli forces. The false impression left by this headline was that 5 presumably innocent Palestinians were killed in attacks with Israeli forces. This headline therefore made the guilty party innocent and the innocent party guilty as it did not include vital context about the nature and origin of the attack. The headline could have easily read: “5 Palestinian attackers killed by Israeli forces”. While the body of the Star’s article was accurate, however, readers view headlines 3:1 over the adjacent article. As a result, many Star readers were likely misled by this headline into thinking that Israel killed 5 innocent Palestinians. 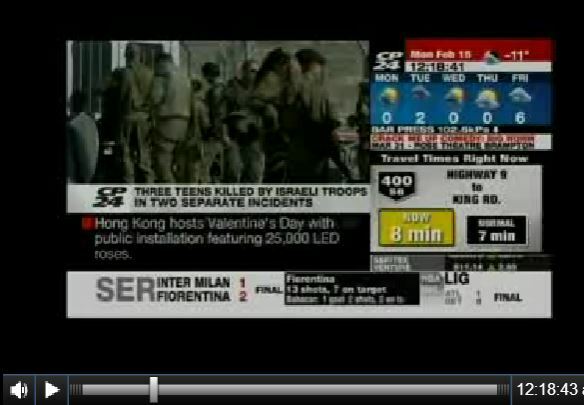 Last but not least, CP24′s coverage of these attacks also turned the Palestinian terrorists into victims of Israeli aggression. 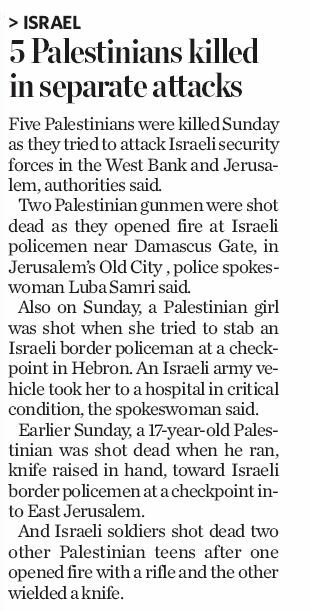 Today’s coverage was headlined “Three teens killed by Israeli troops in two separate incidents,” a headline which altogether failed to mention that the three teens were Palestinian terrorists. CP24′s anchor led the report with emphasis on the “death of three Palestinian teenagers” while stating as fact that the three Palestinian teenagers were killed and shot by Israeli officers. Importantly, Israel’s claims that their forces acted in self defense was stated in attribution only. If you’re angered by the Toronto Star’s and CP24′s coverage which turned these Palestinian terrorists into victims, please communicate your concerns to the Star and CP24 and call for corrective action to be undertaken to set the record straight. Please send emails to the Star’s Public Editor at: publiced@thestar.ca and CP24 now@cp24.com. Unbelievable, the journalistic integrity of a grapefruit! Journalism schools obviously aren’t teaching the basics any more. Recall Trudeau! Sign and share please! Err, I keep getting fooled by this. I see the article’s author as Brian Lilley on the main page, but the actual web page shows different authorship. Please fix your link tags, TheRebel! George, what of the points Pomerantz makes? Your argument fails in the face of that. I can just imagine how the CTV covered this story. But of Course the Palestinian victims would have to wait until CTV reported every little thing about their beloved Syrians first. George Luck: What do you read first in a news article? What catches your eye as you scroll down the page? What is written in larger and darker font in a news article? It is the headline of the news story! So, if someone just read the headline, and not the complete article, that person could be lead to believe that Israelis indiscriminately killed Palestinians! That is the point of this article by the Rebel. That is exactly HOW the mainstream media refocuses the whole point of a news article! That is what I refer to as bias in reporting! Make it appear that the Israelis are a fault! My rule of thumb with the MSM is not to believe anything they say about anything. The lying media is the reason that we have the stupidest twit ever as PM. If you cannot see the spin in these two MSM reports, you are blind. They are written in a manner that makes the Israelis Police look like trigger happy vigilantes. Misinformation is common in the Canadian news media, who’s agenda’s are to mislead the Canadian public and create Jew haters. Trudeau will be proud of them especially the Star, his favorite comic book. Bravo, I agree. Canada’s new reputation since Trudeau’s Liberals took power is disgraceful and will only get worse. The Liberals are damaging relation with our allies, and especially the US, which if Liberals continue on their wholesale refugee importation without proper vetting, the US will close the US/Canada border and make it very difficult for trade to occur … our biggest trading partner. The headline is misleading just as other headlines of this nature around the world do the same. No surprise – Canadians are even starting to be despised on various comment channels – lots of negative comments about the “new” Canada appearing on Breitbart, News Busters and more. Our new reputation is not one that I am proud of. And the media in Canada keeps it growing. Sorry, but you are way out of line on this one. I am no supporter of that rag the Star but the headline is accurate. It may not say what you want it to say. It may not give the whole story but that is what the body of the article is for. Any implication you see in that headline is a commentary on your personal agenda only. I am not faulting you but you must understand that making such unsupportable accusations like this only weakens the brand and makes our outrage less credible when it is really needed.